BOQ Specialist is considered to be one of the preferred banks for medical professionals like Doctors, Specialists, Dentists and Vets. It was previously known as Investec before Bank of Queensland bought it in 2014. Some say BOQ Specialist is just BOQ in name only, and run as a completely separate bank – but is this true? With some really sharp interest rates, and special offers for Doctors and other Medico Specialists (like being able to borrow up to 100% without LMI), BOQ Specialist is becoming a popular bank for medical professionals. In 2019 they have also extended their offering to allied health professionals and select accountants who work with medical professionals. Today I review Bank of Queensland Specialist, including their home loans and interest rates – and put them through their paces! What are BOQ Specialist Home Loans like? What’s the best BOQ Specialist home loan rate? What documents does Bank of QLD Specialist need for a home loan? How much can I borrow from Bank of QLD Specialist? How much does not paying LMI save in costs? What else does BOQspecialist Offer? Is BOQ Specialist the same as BOQ? What are some BOQ Specialist Customer Reviews? How does BOQ Specialist compare to other Medico banks? Note this review, interest rates and product information is correct as at 15 April 2019 and all of this information is subject to change without any further notification. Any applications for credit are subject to meeting the specific bank’s criteria and the decision is at their final discretion. ✅ Great home loan products for medical professionals: BOQ Specialist has niched itself with medical professionals, and as such can offer up to 100% no lender mortgage insurance (LMI) loans to buy a house to live in, or 95% no LMI loans on investment properties by topping up with a personal loan. ✅ A comprehensive suite of commercial loans and business products: Some really sharp products if you are looking at buying commercial property, including the ability to borrow up to 100% for owner-occupier purchases, repayment structure flexibility plus finance for GST and stamp duty. They also have some sharp SMSF deals including being able to borrow up to 90% to purchase a commercial owner-occupied property. ✅ Flexible lending on equipment and car finance: BOQ specialist need minimal paperwork for car loans up to $150,000, and might even look at future projected figures. ✅ Goodwill, practice purchases and fit out finance: Pretty unique goodwill and practice purchase loans, allowing up to 100% of the purchase price of an existing practice and finance to help with a fit out (including costs to cover interiors, equipment, software, furnishings and building renovation) with no repayments needed until the fit-out loan is converted to a lease or chattel mortgage. ✅ Allow the use of current and projected income: Their credit team can consider your current and projected income and wealth, this is particularly useful for recently graduated Doctors or Specialists who have changed fields with high potential income earning. ⛔️ Higher Interest Rates on unsecured portion of your home loan: To lend over 90% LMI BOQ Specialist will give you a personal loan to get to 100% LVR, this generally has a higher interest rate and needs to be repaid within 2-5 years. ⛔️ Interest Rates & specials are not advertised: BOQ Specialist review each application individually and will offer an interest rate to reflect how much deposit you have, what your risk is as a borrower, and lots of other factors. Like their parent company, they have specials from time to time but aren’t advertised online so you don’t know if you have a competitive interest rate (or not). ⛔️ People with bad credit: Bank of QLD Specialist aren’t typically able to help people with bad credit, like discharged bankrupts due to their credit policy. If you have over a 20% deposit BOQ Specialist might consider a lower credit score on a case by case basis. ⛔️ May not consider smaller home loans: BOQ Specialist has only recently launched into the Mortgage Broker channel, and they will only do residential home loan lending if there is over $1m in lending – or may consider a smaller home loan if you are buying a car or commercial property at the same time. ⛔️ Strict qualification criteria: BOQ Specialist only works with Medical, Dental and Veterinary Professionals, and accountants who work with medical professionals. So if you don’t work in one of these professions, even say you are a Nurse you won’t qualify for finance through BOQ Specialist! Unfortunately, if you aren’t a Doctor, Specialist, Dental Professional or Vet you won’t be able to use BOQ Specialist. BOQ Specialist Banking Package is pretty similar to most banks professional package home loan, where you receive a discounted home loan interest rate and a few other banking products all under the one annual package fee of $395. The variable home loan rate is similar to BOQ’s Privileges Package Home Loan. BOQ Specialist regularly offer non-advertised rates directly to Mortgage Brokers that they do not openly advertise. If you would like to know more info, call us on 1300 088 065 or get in touch. Read More: What Specials do Doctors get on home loans? Similar to their parent bank BOQ, the private banking division can offer you protection from interest rate rises, and provide a fixed rate term of between 1 to 5 years. Read More: Fixed Interest Rates – Are they a good or a bad idea? The BOQ Specialist Basic Home Loan is fairly similar to most banks basic home loan package. It’s a no-frills product, with minimal features and at the same time minimal fees. You might be able to save a bit on your costs using the BOQ Specialist Basic Home Loan product, provided you don’t need any of the other fancy features offered on the Banking Package product. ⛔️ $10 monthly home loan fee applies unless you open a BOQ specialist Transaction account (One Account) and make repayments from this account. The monthly fee is waived if you settle a basic home loan before 31 August 2019. The major downside to this product is the fees and the fact that you need to move all of your lending to BOQ Specialist to avoid paying account keeping fees. Many other Basic Home Loan Products, like Suncorp’s Back to Basics Variable has no upfront and ongoing fees. Bank of Queensland Specialist has a pretty strong Commercial Property Loan offering, including up to 100% LVR (no deposit) lending for medical professionals. In other words, if you are buying commercial property to run your medical business from, you won’t need any deposit and they might even provide additional finance for GST and stamp duty. ✅ Borrow up to 100% if you are buy-in premises to occupy, no lenders mortgage insurance. ✅ If the purchase is in SMSF, borrow up to 90% on commercial owner-occupied properties or 65% LVR for residential SMSF investments without any LMI. ✅ Up to 15-year term with interest only, principal and interest, variable and fixed rate options. ✅ Strong offering to assist with goodwill, and practice purchase loans. The commercial offering from BOQ Specialist is one of the better ones in the market if you are considering buying commercial preemies to operate from. Their fit-out finance offering is also quite good for medical professionals, allowing the funding of interiors, equipment, software, furnishings and building renovation. ✅ Fairly relaxed credit policy for medical, dental and veterinary professionals looking for car loans up to $150,000. ✅ Ability to borrow as little as $2,000 to larger sums to assist with practice equipment, and fit out finance. Like other Private Banks, BOQ Specialist can provide a bit more flexible if you are looking at starting a new practice or purchasing an existing one. This is where it gets a bit more difficult. BOQ Specialist reviews each application individually and will offer an interest rate to reflect how much deposit you have, what your risk is as a borrower, and lots of other factors. Like their parent company, they have specials from time to time but aren’t advertised online. The difficulty with this is if you go to BOQ Specialist direct, you may not be getting their best offer. What documents does BOQspecialist need for a home loan? The document checklist for commercial lending is much the same, with the exception of requiring lease agreements and tenancy schedules for existing leases in place. BOQ specialist has fairly stringent requirements on documents for both residential home loans, and commercial lending. Download their residential home loan checklist and home loan application form. They also require you to be working full time as a Doctor, Dentist, Veterinarian – or as an Allied Health Professional, or Accountant that works with medical professionals. What does ‘Allied Health’ actually mean? If you are a Doctor, Dentist or Vet you may receive a larger discount. Speak with one of our doctor home loan experts on 1300 088 065 or by filling out our online enquiry form. Figures as at 11 April 2019, subject to credit criteria and will change without notification. 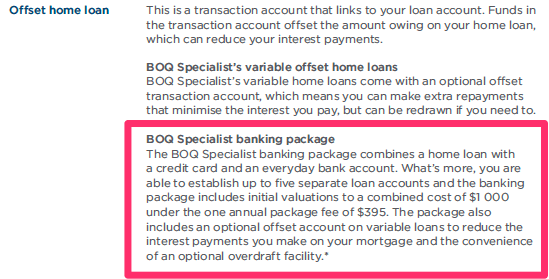 BOQ Specialist is a little different to some other banks, as a medical professional they will consider projected income and wealth and could even lend up to 100% of the purchase price if you’re buying a home to live in without lenders mortgage insurance. This means the figures are going to be a bit different from the regular scenario. If you are wanting to understand how much you can borrow based off your future earnings, get in touch with our Mortgage Brokers on 1300 088 065 or complete the free assessment form online. How much does not paying LMI save? Lenders Mortgage Insurance is paid on a sliding scale, the more risk for the bank the more the premium costs. Let’s look at a few examples of what LMI would cost if you don’t qualify to have it waived. On a $900,000 loan based on a $1,000,000 purchase, the LMI premium costs as much as $30,256! On a $950,000 loan assuming a $1,000,000 purchase, you will be paying $58,729 in lenders mortgage insurance! If you are a Doctor, or Medical Professional it is worth looking at having your LMI waived. BOQspecialist offers everything you’d expect from a full-service bank. Bank accounts, credit cards, car loans, personal loans and term deposits. Their most popular product is the BOQ Specialist One Account. It’s an everyday transaction account with no monthly fees and 1.25% interest rate. The downside is BOQ Specialist charge a $5 overseas ATM fee. Well that… And if you aren’t a Medical Professional, Doctor, Allied Health Professional or Accountant you can’t get one! BOQ Specialist is a fully owned division of Bank of Queensland. And they have their own banking products, and service offering specialising in helping medical, dental and veterinary professionals. So in effect, their home loan, credit card and transactional products are pretty much the same. Where they are different is their service offering, and approach to credit policy. If you are a Medical, Dental or Veterinary Professional you will find BOQ Specialist to be a bit more flexible in their approach to approving your Home Loan. As we covered in our review of BOQ, their customer satisfaction ratings were one of the highest out of the Australian banks at over 87% compared to the major banks whose customers rate them at 78.50%. Being a Private Bank, you would expect BOQ Specialist to excel in customer service and from their reviews they do. Is BOQ Specialist the right bank? We have over 30 lenders on our panel, and quite a number of them offer discounted interest rates and no LMI for doctors and other select professionals. Talk to one of our mortgage brokers calling us on 1300 088 065 or complete our free assessment to find out more details and see if Bank of Queensland Specialist is a good fit for you.